A Utility Van in GTA San Andreas (Rear quarter view, no colored stripes). The Utility Van is a utility pickup truck in Grand Theft Auto: San Andreas. The Utility Van resembles a GMC GMT400 work truck from the 1990s. The engine is definitely a diesel because of the slower shifting and deep sound, and it could very well be a V8 that is obviously underpowered to pull a heavy vehicle like it is. It drives somewhat like a semi truck. 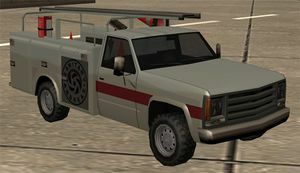 The Utility Van is one of three vehicles in the game bearing a Sanitary Andreas logo, the other two being the Sweeper and Trashmaster. The Utility Van can tow a Utility Trailer, but the Utility Trailer is not found anywhere in San Andreas. It can only be obtained through the use of modifications or trainers. The Utility Van does not have very good driving attributes, as it has a rather slow acceleration and top speed. This is probably because it is a very heavy vehicle. The braking is probably one of the Utility Van's best attributes, as it is above average. The Utility Van plays the radio station K Rose by default when entered. The Utility Van is usually found near airports or industrial areas in the state, such as the main terminal of Easter Bay Airport. This page was last modified on 14 April 2014, at 18:12.